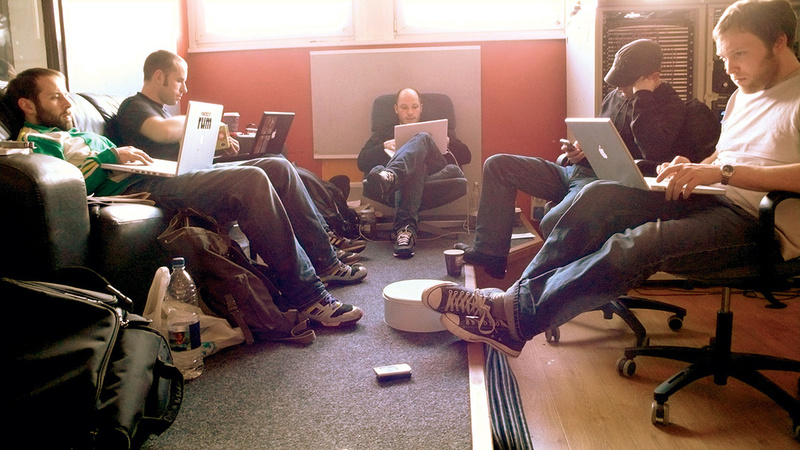 Six albums into their career, Glaswegian instrumental band Mogwai decided to take the producer's chair themselves. Since Stuart Braithwaite and Dominic Aitchison formed Mogwai in 1995, their largely instrumental music has come to define the 'post-rock' genre. A mixture of brutal guitars, plaintive piano and electronics, it has been extensively licensed for television, films, commercials and video game soundtracks. Last year's LP The Hawk Is Howling is the band's sixth studio album. 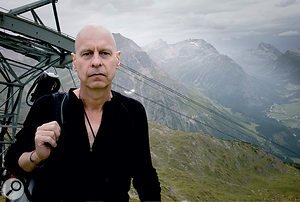 Mogwai guitarist and recording engineer John Cummings was behind the desk, and also contributes piano and programming to the band's rich sound palette. As one would expect with a working band whose line-up hasn't changed in a decade, Mogwai have an established creative process, as John outlines. "The tracks tend to start off as individual rough ideas or recorded sequences that we have individually, and then we'll do a quick demo of them at home so everyone's got something to work from. We've all got laptops, so it tends to be Garageband, Ableton Live or Pro Tools, depending on which band member is doing it. Then it will be circulated amongst us as MP3s — and these will range from the most basic sketches to other pieces that are more structurally complete. 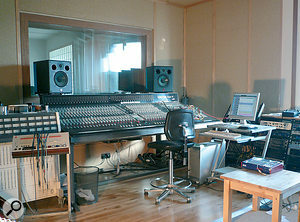 Chem 19 in Glasgow, where The Hawk Is Howling was recorded, is based around an Amek Einstein desk. 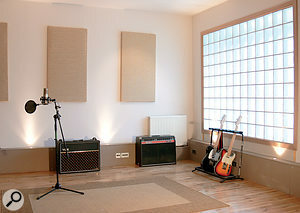 The live room at Chem 19. As such, the recording process was open‑minded, with approaches ranging from a fully miked drum kit to a simple single room microphone. Mogwai's distinctive multi‑layered guitar sounds are achieved through a mixture of old-school and new technology. Their backline is predominantly Fender or Marshall amplifiers, but specifically Marshall bass heads. Guitarist Barry Burns also uses a Matamp stack, described by Cummings as "a bit like a gritty Orange, but more awesome.” However, to achieve the complex sounds, acoustic recording is augmented by an array of software for guitar, keyboards and synthesis. "Guitar Rig is a pretty good effects rack, but it's the Waves GTR3 that we would go to for usable amp sounds,” expounds Cummings. "We have used real pianos quite a lot when we've had access to them, but with laptops, we have access to the VST ones as well. I'm a huge fan of [NI's] FM8 — really impressed with the range of sounds you can get out of that. We use Akoustik Piano a lot as well, and Barry uses Ohm Force [plug-ins]. We've got the Korg Legacy Collection, which is pretty good, and I think Barry's using the [Arturia] Minimoog stuff quite a lot. But the FM8 is definitely my favourite keyboard. I've used Battery quite a lot for rhythm sampling, plus Reaktor, SuperCollider and Melodyne. "We've also got a great wee Philips organ as well — a 1960s Philicorda from a car boot sale. I had to cobble together the wiring because it was one of those old flat and round pin speaker connections.” The band were tempted to take this out on the road, but generally Barry's VST keyboard instruments are coming off a rackmounted Muse Receptor controlled from an Edirol PCR50 keyboard. Castle of Doom, where Gareth Jones mixed the album on a Euphonix CS2000. Jones was given the simplest of briefs: Keep it big. "Obviously, the band needed to be involved,” says Jones, "and I needed their input, so it made budgetary sense for me and my assistant [James Aparicio] to go to Glasgow. 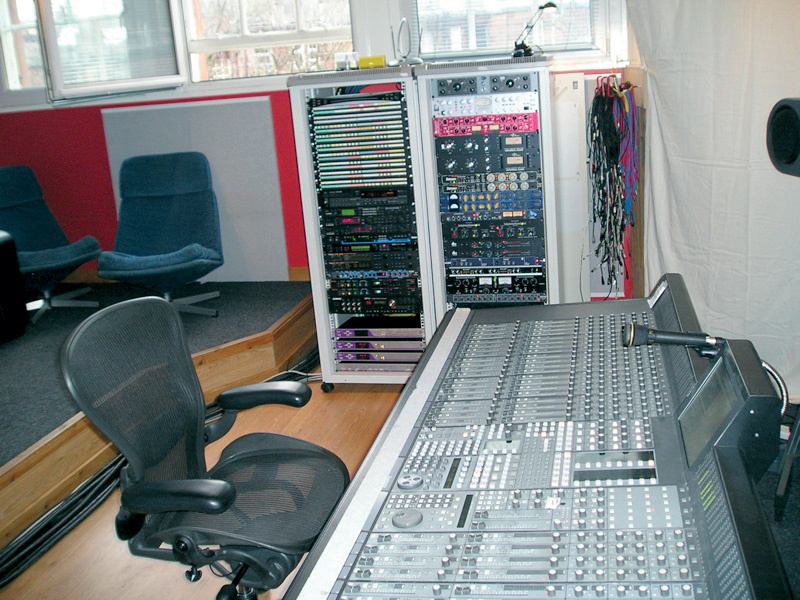 I took my eight‑core Mac up to Scotland, loaded with plug-ins, and DSP — two UAD cards, TC Powercore X8, Waves APA 44M and Focusrite Liquid Mix — so apart from the nice analogue gear at the studio, I had my own arsenal of plug-ins. The Waves Studio Classic bundle and my UAD plug‑ins, together with the Liquid Mix, were all used all over the place for colour and dynamic control. I am also a big fan of the PSP plug‑ins. 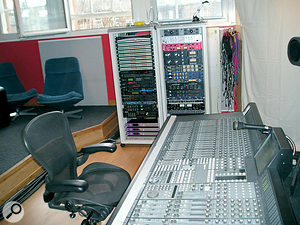 There were some big Linn speakers in the studio that I was not familiar with, but they seemed very useful. As always, I also took my trusty powered Dynaudio BM6As and Sennheiser HD650 headphones. 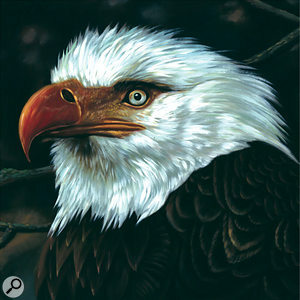 Mogwai tracks often start with a plaintive piano motif or phrase. Guitar, bass, drums and all manner of unworldly noises are added whilst the piece builds, twists and turns, then shifts and builds again. Once you have got over the expectation of hearing vocals, you don't miss them — in fact, the purity of their music is in the absence of the human voice. "I guess mixing instrumentals is just different,” says Jones, "perhaps easier in the sense that you don't have to make room for vocals, but harder in the sense that you do not have the anchor that is the vocal. Guitar foot pedals are an important element of Mogwai's sound, both in the studio and live — so much so that Electro-Harmonix even produced a limited issue 'Mogwai Big Muff' with a slightly more extreme sound. "Distortion and delay have always been the ones that we've used the most,” recalls Cummings. "Stuart uses a Fab Tone and Rat pedals. The past few years I've been using a lot more EQ and reverb pedals, which help live from song to song. And a bit of tremolo — I like a bit of tremolo. The Boss ones are pretty good and we've had amazing Fab Tone ones, and there's a really good Frantone Electronics Vibutron — that's outrageous. Wah is always a hit, and the coolest pedal that I've got at the moment is the Electro‑Harmonix Hog. "For delays we use quite a lot of Boss — DD3, DD5, DD6 — and the new Electro-Harmonix Stereo Memory Man. We've had a really great relationship with the people from Electro-Harmonix over the years, and the new pedals that they're coming out with are a lot more robust. I'm a bit more confident about taking the new Memory Man out on tour than the old Memory Man.